As I was eating breakfast at my desk this morning, I got a text from a friend saying “Love the article in the ‘Iowalife’ section today!”. I grabbed the copy of the paper I had just picked up from the doorway of our office and pulled out Section E.
And there I was! My column from DM Juice and Metromix was above the fold in this morning’s Des Moines Register Iowalife section. An exciting day to say the least!! 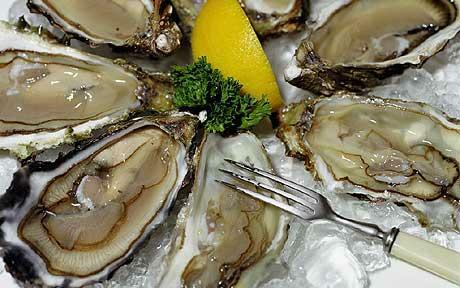 Oysters on the half shell at Waterfront. p.s. Watch for a post later tonight about the return of “Mad Men” and the drinks that fuel Madison Avenue! Look at that title….I’m getting seriously good with puns. So fun news here in Flyover country…I’ve been published! A big “thank you” to the good folks over at Metromix for letting me write a short column about, what else, eating. It was an exciting morning as I got to see myself in “print” for the first time. The world is my oyster on the half shell. I was 2nd in their new series where local foodies talk about their favorite local “craving” spots. While you’re on their site, check out some of the other great food and drink articles. Plus, they have tons of lists for local restaurants. And you know I LOVE a good list. p.s. 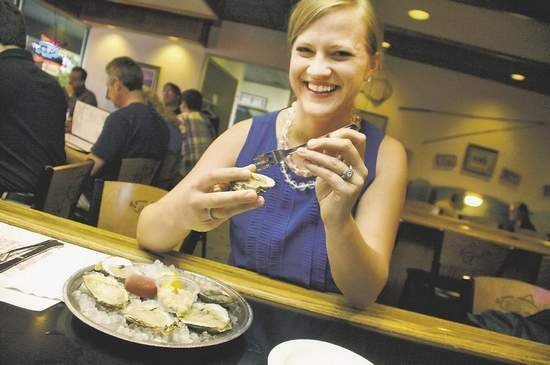 Special thanks to Joe Lawler for the article and Eric Rowley for joining me for a delicious oyster lunch/photoshoot!